You may or may not know that COMIX started because I had a vision of creating my own comic book. The irony is that COMIX actually made that dream come true. My distributor Kino Lorber and I wanted to make the COMIX 2-DVD set even more special, especially for comic book fans. I remember the if-you-build-it-they-will-come moment I had. It was like a thunderbolt moment really. “Make a comic book,” my inner voice said. Enter two great human beings, my friends Julian Aquino and Paul Limgenco, the amazing and experienced artist who also created the movie poster. 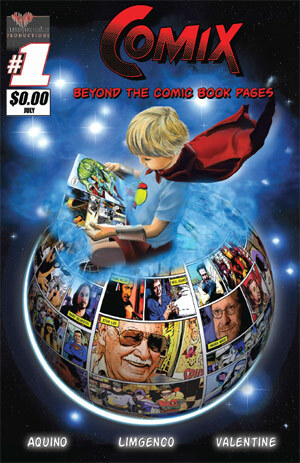 The poster centered around a little boy named Jack who appears in the film, so it made perfect sense that he was also the inspiration for the comic book. The storyline is a young boy’s discovery of comic books and his adventures that come to life with every turn of a page. Julian and I are kindred spirits. We talked comics all the time. When I told him that there was only two weeks to complete the book, he looked at me like I was crazy, and then said, “I’m in!” So we went to work creating the details, including a rough draft with sketches of each panel and the pacing for each page. Even though we had little time, the story just came out so naturally. We worked day and night to get it to Paul so he could start working on penciling the real drawings. Paul worked into the late hours making sketches and sending them to us to approve. We had many Skype calls discussing everything from facial expressions, coloring, shading, body movements, even the way a chair looked, just to get it right. It was an exhausting race but, the truth is, we enjoyed every minute of it. With a few hours to spare, we made the deadline. Paul and Julian really stepped up their game and came through BIG time! I am so proud of our COMIX comic book. Hope you enjoy it and that it taps into the child inside you and that wonderful feeling of discovery. AND JUST LIKE THAT, 2018 IS FLYING BY FASTER THAN A SPEEDING BULLET….. TO COMIC BOOKS AND BEYOND! COMING SOON…COMIX THE TWO-DISC DVD!